The weather is cold and often snowy, but a trip to Krakow in December is worth it just to see the city’s Christmas celebrations. The city's Main Market Square has been the site of a trading market for hundreds of years and is the center of holiday festivities, and Poland's most famous Christmas market is set up here every December. Furthermore, all the lights and decorations make the center of Krakow even more beautiful. The average temperature in Krakow in December is about 32 degrees Fahrenheit, but temperatures fluctuate throughout the month. There’s a chance of snow just about every day, which means you'll need to bundle up if you hope to enjoy your trip to Poland this time of year. However, there are still plenty of dry days to enjoy some outdoor activities, including mountaineering, even though the city only sees about one hour of sunshine per day all December long. When packing for a trip to this city in southern Poland, include warm clothes that let you dress in layers and boots suitable for walking around in the snow. You'll want to pack plenty of sweaters, long-sleeved shirts, pullovers, pants, and maybe even some long underwear for an extra layer of warmth against the cold. A scarf, gloves, and hat are also necessary to protect yourself from the winter conditions, and you may want to pack an umbrella and raincoat in case it rains during your visit. 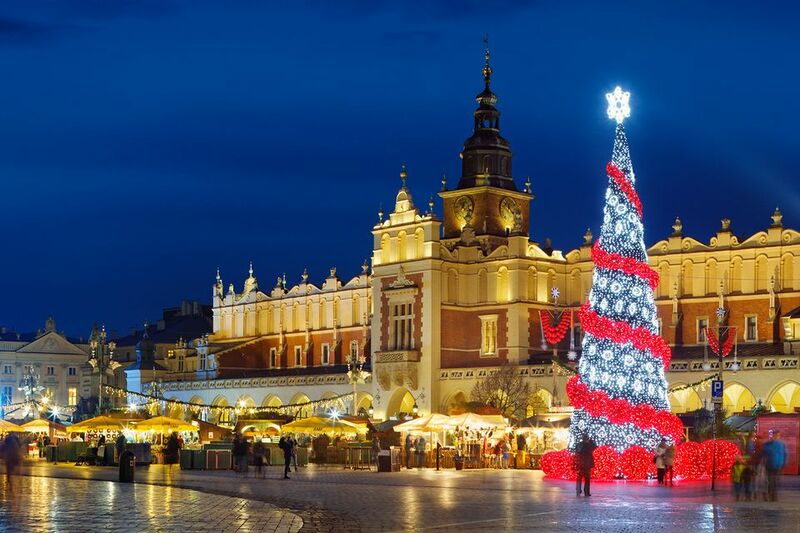 Old Town Krakow takes on a special ambiance during the Christmas season. The aromas of Polish seasonal foods wafts from snack stalls and huge Christmas tree lends a stately elegance to the square, glowing with lights after daylight fades. However, the entire city also hosts a variety of festive events throughout the month, and a variety of traditional local celebrations on Christmas Eve and Day, as well as several other non-religious events that take place in the city throughout the month. Krakow Christmas Market: This annual market in Old Town Krakow invites dozens of local makers to sell seasonal traditional Polish food and hot mulled drinks as well as handmade goods. Traditional Polish gift items are also for sale, including jewelry from the region, art, and Polish Christmas decorations. Christmas Creche Competition: On the first Thursday of December, this annual competition takes place in Main Market Square and invites local and international chefs to prepare their best versions of szopka, the Polish version of creches. The making of Christmas creches is a Krakow tradition, and Krakovian Christmas creches are elaborate works of art that pull elements from the city’s architecture, distinguishing them from creches made for the holiday season elsewhere. Christmas Eve: The traditional Christmas feast in Poland occurs on Christmas Eve, or Wigilia, a day that holds equal importance with Christmas Day. Before the table is set, straw or hay is placed under a white tablecloth. An extra place is set for an unexpected visitor, as a reminder that Jesus and his parents were turned away from inns in Bethlehem and that those seeking shelter are welcome on this special night. The traditional Polish Christmas meal consists of 12 dishes, one for each of the 12 apostles. It's officially Christmas Eve, according to local tradition, when the first star appears in the night sky. Christmas Day: Christmas celebrations in Poland follow many Catholic traditions, including some observed in the United States. Polish Christmas trees are decorated with shapes cut from gingerbread, colored wafers, cookies, fruit, candy, straw ornaments, decorations made from eggshells, or glass ornaments, and midnight mass is a standard religious ritual for many in Krakow and across Poland. Krakow Mountain Festival: An ongoing mountaineering event that takes place throughout the month of December and attracts mountain climbers from around the world. The Festival also includes film screenings and workshops along with competitions in this favorite local pastime. New Year's Eve: Although there will be plenty of parties to choose from in bars and venues across the city, the biggest celebration in the city takes place in Market Square, which becomes a large concert venue with free shows by some of Poland's biggest stars. The evening is capped by the ringing of the bells in St. Mary's Cathedral and a fireworks show. Since Christmas is a popular time for tourists to visit Krakow, visitors should expect to pay mid-to-high season rates for accommodations and airfare. Be sure to book your itinerary well in advance so you can shop around for the best price—especially if you're traveling toward the end of the month. You can also book your trip for late November or early December if you want to avoid the inflated cost of holiday travel; however, in recent years, rates on airfare and accommodations have stayed pretty level throughout the last part of the year. While Christmas events and festivities are the biggest tourist draws in December, there are also plenty of great concerts, theater performances, art galleries, and museum exhibits to explore this month.